The GLXD16 Bodypack Wireless System is part of the GLX-D wireless systems family. Revolutionary Shure GLX-D® Digital Wireless Systems combine leading-edge LINKFREQ Automatic Frequency Management technology with best-in-class intelligent lithium-ion battery rechargeability to define the new standard for seamless operation and digital audio clarity. 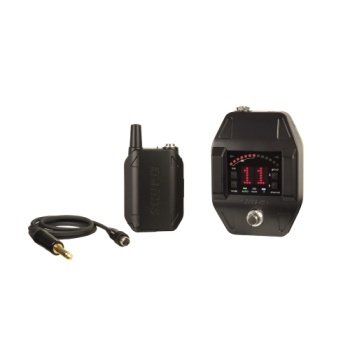 Includes GLXD6 guitar pedal receiver, GLXD1 bodypack transmitter, guitar cable, rechargeable battery, power supply, wall battery charger, and user guide.